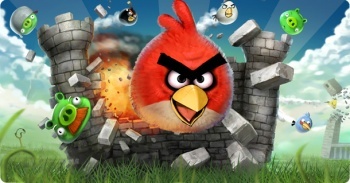 Angry Birds is now popular enough to be one of the three most pirated brands in China. Congratulations? The Angry Birds train has had a great amount of success, especially when it comes to China. The fun puzzler has become a phenomenon making the franchise one of three most pirated brands in China, right next to Disney and Hello Kitty. Everything from plushies, t-shirts or backpacks designed to look like your favorite fluffy bird can be found and purchased. Rovio plans to fight pirating by making quality designed products, and has also built a office in Shanghai in order to design their own official products. For example, the company is stuffing "Angry Birds magic" into the official plush toys that will add features to make the toys superior to the mere copycats. If that's not enough, the franchise even has a cookbook coming out to show different ways to prepare tasty eggs. According to Rovio, there are over 100 million monthly active users for Angry Birds since the launch back in December 2009, so it's safe to say this game is still going strong. You can play it on everything from an iPad to your Chrome browser, so it's not surprising that the numbers are so high, but do we really need to know how to cook Angry Eggs?